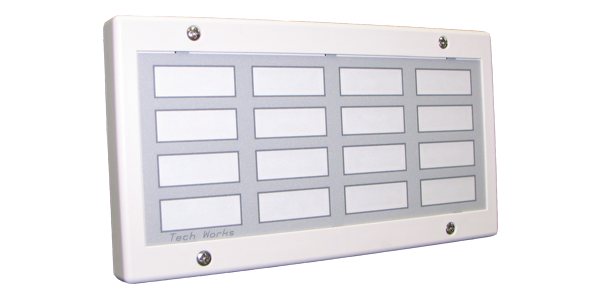 The Tech Works CC-MC-16-T is a 16-Light and 16 Button Intelligent Master Control panel. By pressing on each of the lighted squares the lights can be turned on and off. Made of white ABS plastic with a removable faceplate, each unit can be custom labeled to identify staff or locations. An integral tone sounds to draw attention to any change of status. A big window allows for large labels of call points. Labels are back-lit so the call point lights up when a station is active. This is a digital communication device using Intelligent Control Modules for call point monitoring. Each CC-MC-16-T corresponds to four CC-CM-4 Control Module or CC-RS-4 Room Status Stations by simply setting matching addresses. To have two or more CC- MC-16-T talk to each other, simply place two CC-MC-16-T annunciators where needed and set the address to match. The tone can be permanently disabled via a dipswitch. Mechanical mounting is to an industry standard 4 gang electrical box. No special hardware or custom mounting box is required. Power: 12VDC, 264 MA Max.